Savannah gray brick walls and original Low Country artwork make this room at our Savannah luxury hotel cool and cozy! 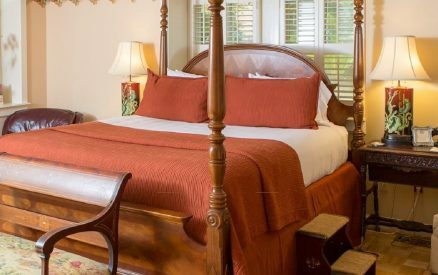 Queen-size brass bed, beautiful turn-of-the-century armoire, antique wicker and your very own cherry Low Country rocking chair gives an authentic feel to this space at our Savannah Hotel. Cream imported Italian matelasse coverlet adds luxury. Best Value! Best view of the courtyard at our historic Savannah Boutique Inn with two antique iron, extra-long twin-size beds. 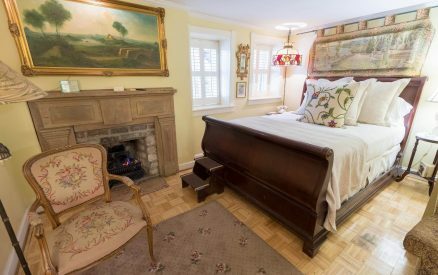 Elegant touches include golden, Italian matelasse bedding with Williamsburg reserve collection needlepoint pillows. Large corner room at our Savannah luxury Inn with windows facing the garden courtyard and Oglethorpe Avenue. The king-size cherry bed is plush in paprika, imported Italian matelasse, with four sumptuous Euro pillows. A wing back chair, armoire, and a lovely Victorian deacon’s bench complete the room’s cozy setting. The Savannah gray brick fireplace with new coal gas fire set and remote provides a warm and relaxing ambiance to this accommodation at our romantic Savannah hotel.